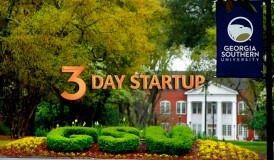 The Georgia Southern University Business Innovation Group (BIG) invites the community to hear the latest business startup ideas from students during the 3 Day Startup (3DS) final pitch presentations at 7 p.m. Sunday, Feb. 21, in the Auditorium of the IT Building. 3DS is a weekend-long program for students to get their hands dirty, validate products and build prototypes in just three days. On Day 1, the participants arrive with their most promising ideas for new companies. Some bring pre-built technology that is waiting to be commercialized while others literally bring napkins with their ideas written on them. The ideas that survive make it to Day 3 where teams demo their prototypes and pitch their companies. Through this intensive event, 3DS participants brainstorm ideas, conduct market validation, devise business models, build prototypes and pitch to investors and successful entrepreneurs. The result is an experience that challenges participants to actually innovate, build and launch companies. The goal is to build entrepreneurial capabilities in students, build a community pipeline and kick-start new companies. Since its inception, 3DS has hosted more than 100 programs across five continents and launched scores of startups collectively raising millions in funding. Dozens of 3DS startups are accepted into prestigious accelerator and incubator programs. 3DS boasts more than 5,000 alumni across 90 programs. For more information or to get involved with the event, contact Suzanne Hallman at shallman@georgiasouthern.edu.